Eeew! Wanna get grossed out? Drive behind a chicken truck–flat bed to be exact. If you do, make sure to close your windows. That’s because the funk that flies off chicken trucks is infectious. Researchers at the Johns Hopkins University checked their cars for bacterial samples after driving 17 miles behind chicken trucks on the Delmarva Peninsula (a coastal area that includes parts of Delaware, Maryland, and Virginia), chosen for its high volume of broiler chickens being transported per acre. The scientists drove up and down the highway multiple times with windows rolled down and air conditioners turned off. Chicken funk shot into the open windows. Sounds gross, doesn’t it? They then collected air samples, and swabs off the doors and sodas cans to check bacterial levels. They were studying the potential of infectious transmission coming from poultry transportation. What they found is enough to make your skin crawl: High levels of bacteria were present in every trial and they even found some antibiotic resistant strains. Yecccch!!! 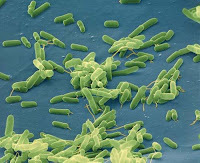 The good news is that most of the bacteria present in the chicken sludge is usually spread by food or water, not air. But, either way, getting caught behind a chicken truck is a nasty endeavor. 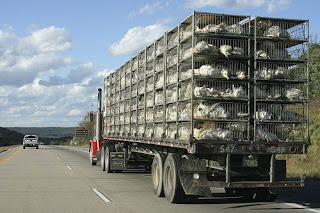 The researchers advised that anybody getting stuck behind a chicken truck on the road should pass it quickly. And please…roll up the windows.